Editorial stock photography photographs photos images, India, Agra to Bharatpur to Jaipur, Rajasthan. Abhaneri step-well, Jantar Mantar. Street scenes, farming, brick making kilns, palaces, Amber Palace, people. Agra, India. Young Woman from Agra. Agra, India. 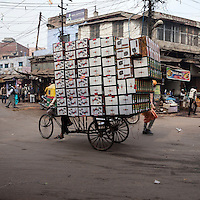 Street Scene, Kinari Bazaar Area. Agra, India. Post Office Box on a Banyan Tree. Agra, India. Back End of a Decorated Rickshaw. Agra, India. Barbershop on the Sidewalk.